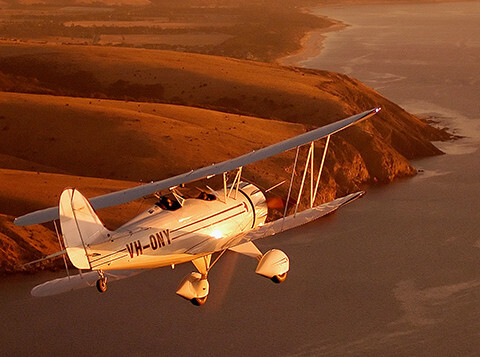 Imagine the joy and sheer romance of an open cockpit flight along the stunning McLaren Vale wine region’s coastline….. 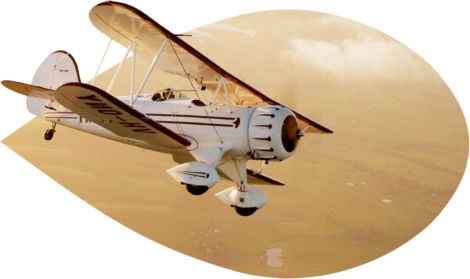 There are any number of very special reasons why people book a flight in our exciting, powerful and timelessly sensual WACO biplane. For some, it is indeed about sharing a highly romantic and truly unique experience with a very special person. For others, it’s about giving an ultimate gift that is certainly different, is high on the “wow” factor and which delivers unadulterated 24 carat indulgence. There are those for whom a WACO flight is all about terrific views from the open cockpit of a fabulous aeroplane that even sounds and smells great. 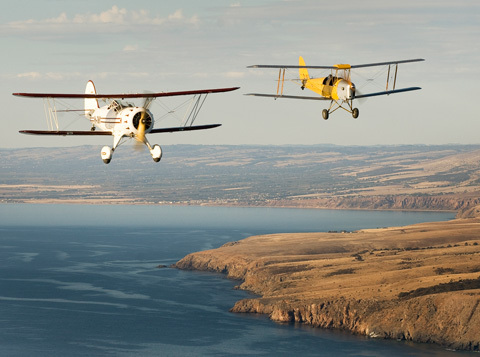 Of course, there are others who are real flying enthusiasts who want to savour the nostalgic experience of a classic biplane and a magical bygone era in aviation. 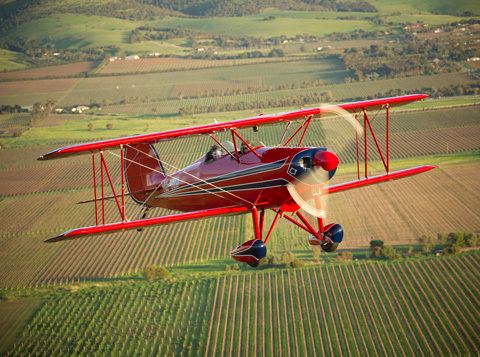 The Adelaide Biplanes’ WACO … Awesome! 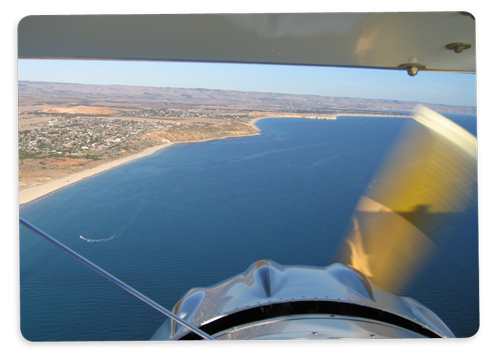 When you join us for a flight, the experience will often start with your first sight of the somewhat yesteryear and rather retro-style of the Aldinga Airfield itself. Indeed, as someone has suggested, it’s a classic airfield straight from central casting. 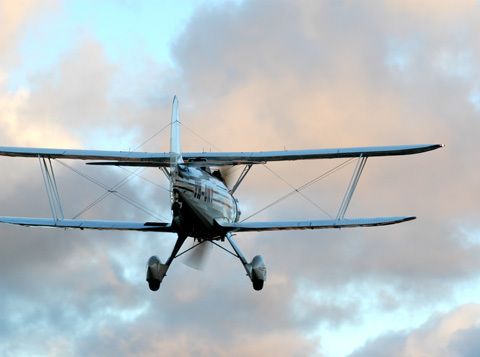 But then you have your initial glimpse of the WACO biplane itself. Much bigger than you might have expected, it sits quietly waiting for you. Powerful, raw, timelessly sensual, breathtaking and awe-inspiring. The excitement mounts long before you have even left the ground. Then you climb up onto the big wing and position yourself into the front cockpit. It feels like nothing you have encountered before. The noise too is marvellous as well as the aroma. This really is different. And so it is on to pre-flight checks … contact … and away! Once aloft, you will be immediately surrounded by a rich panorama of vineyards, hills, cliffs, the ocean, unspoiled white beaches and the magnificent sky itself. All viewed from your open cockpit and with the wind in your hair. And then it’s time to land. A marvellous experience in itself, which simply adds just one more magic memory of your flight to enjoy and remember. So why not call us today to make a booking or to find out more.